perform multiple Search/Replaces, including searches based on regular expressions, pattern matching and "sounds like"
First-time users will find it helpful to check out the tutorial in the online help before delving into the TextPipe tools. It's very brief and will only take five minutes. This is time well spent because, while TextPipe is simple to use once you've grasped the essentials, the interface is lacking a little in intuitiveness. The first step in using TextPipe is to specify which files to process. You can input as many files or folders as you like, and specify files or folders to exclude from processing. TextPipe can load a file list automatically, and you can specify how many levels of sub-folders TextPipe should include when processing folders. You can use any or all of these methods in a single operation; alternatively, TextPipe accepts data from the clipboard. Once you've chosen the files, you select the filters you wish to apply and configure them where necessary. Filters vary in complexity, some requiring no parameters, others calling for user input. The filter dialog windows are largely informative and well laid out but some filters, such as Search/Replace have hidden abilities; so check the online help if you want to make the most of each filter. 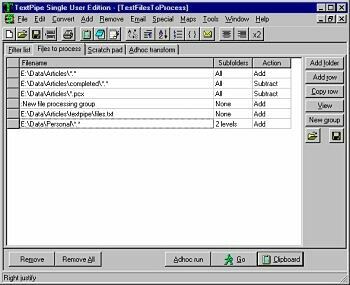 The next step is to nominate whether you Assessment want to overwrite existing files or place the output into new files or the clipboard. And that's it! You're ready to go! 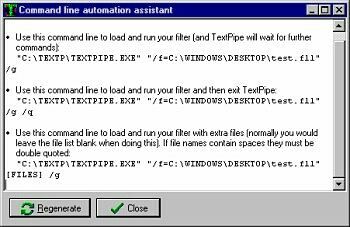 Before you do, though, a warning - TextPipe lacks an Undo feature, so you'll need to be careful not to corrupt critical files. The Adhoc Run button and the Scratch Pad tab are there for just this reason and offer facilities for testing filters before you apply them to live data. 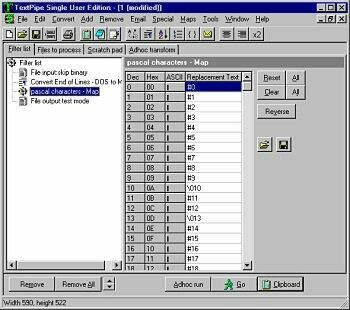 While TextPipe is primarily intended for text files, it can also process binary files. In such cases, TP's ability to warn you when you attempt to replace strings of differing length is a useful feature. You can also set up TextPipe to process files automatically, using its command-line assistant. Once I'd got to grips with TextPipe's interface, I found it very easy to use. Despite a bewildering range of filters, there are only four basic steps in the conversion process. There are a few minor interface quirks which need a little attention by the developers, such as "found text" out of sight in the Proceed window. However, I'm impressed with TextPipe and its versatility and have no hesitation in recommending it. TextPipe is shareware; if you register, you'll receive not only free e-mail, fax and phone technical support, but also free upgrades! Normally US$129. Download order form and 14-day evaluation copies from http://www.datamystic.com/. Windows 95 or Windows NT, 1.6 MB free hard disk space.